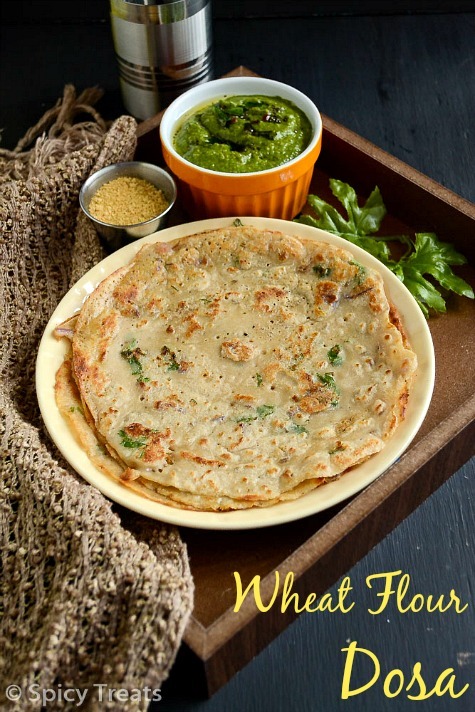 Spicy Treats: Godhuma Dosai / Wheat Dosa / Wheat Flour Dosa - Easy Breakfast Recipes ! In a bowl take flour and salt mix well and using water make it to a medium thick like dosa batter. Then to the batter add cumin seeds, pepper, finely chopped onions, ginger, cilantro and stir well. Adjust batter consistency, if its thick add couple of tbsp of water. Now the batter ready to make dosa. Heat a griddle, when its get heated pour a ladle full of batter to it and spread it in a circular motion to a thin crepes. Drizzle oil around and cook it in medium high heat for 2 minutes then flip other side and cooked for another 1-2 minutes or until crisp on the edges. Once done remove from the griddle and serve hot with chutney/sambar. We had it with cilantro chutney & Idli Podi. 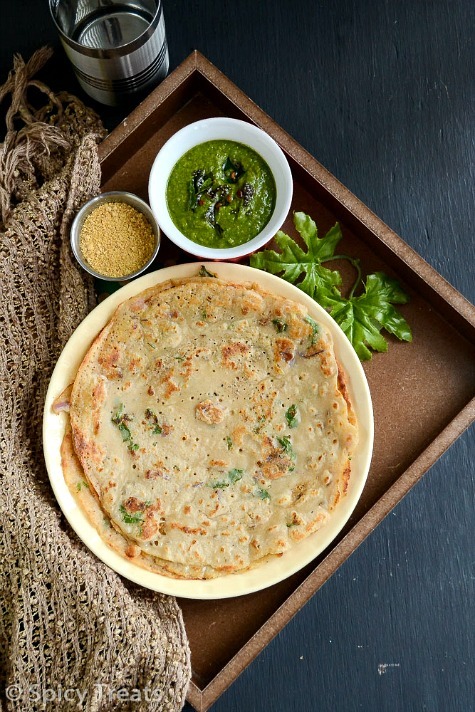 To the same batter you can also add 1/4 cup rice flour, 2 tbsp rava for a crispy & thin dosa. If adding rice & rava make batter little thin than the regular dosa batter. For a more healthier option, add 1/2 cup ragi flour(millet flour) to the above ingredients and make wheat-ragi dosa. I sometimes make it that way. If you like you can also add finely chopped green chillies instead of pepper. I love wheat dosa but I make it plain. Love how you have spiced it up. Tempting clicks. 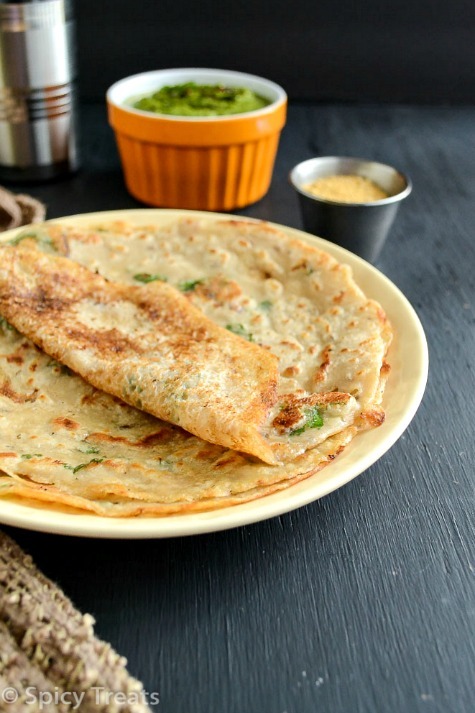 Healthy dosas, and love the flavors in it.. Very healthy and yummy dosa. Simply yummy and healthy breakfast. healthy dosa n loved all ur clicks dear!!! Lovely clicks and my hubby's all time fav dosa!! 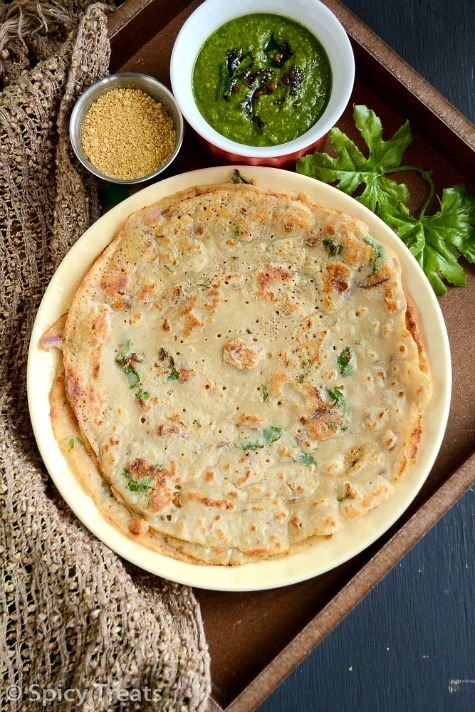 Easy to make and healthiest too..
Love to start my day with this healthy instant dosas..
Hi Sangee. I am excited to try out this recipe and read your notes. 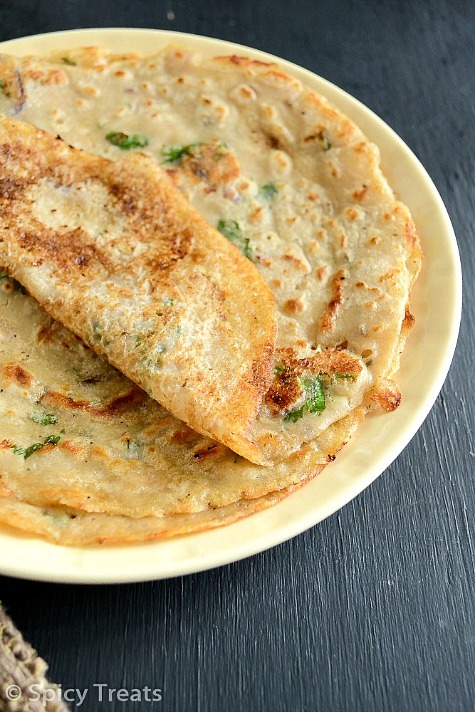 Do you add 1/4 cup rice flour and 2 tbsp sooji to the 2 cup wheat flour for the thin and crispy dosas? Yes. Adding rice flour and sooji gives nice flavor and crispiness to dosa. Hi, I tried this for my LO with some grated veggies added to the batter, but the dosa was very sticky. Why is it so? Hi ..there are few reason for sticky wheat dosa, do not cook dosa in high heat, cook in medium heat and make the batter little thin. Also you added some grated veggies, so you cannot make thin dosa and it will be bit thick like regular plain dosa, so you should cook it in medium heat. Next time if you add more veggies, try adding 1-2 tbsp of rice flour or rava/sooji to the batter. Hope this helps!